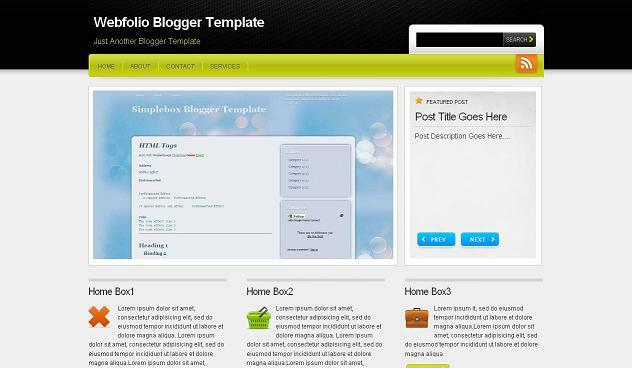 Webfolio is a free premium like blogger template which all you will be going to like for sure.It is magazine style template with many inbuild features and ready widgets inside it.Some of the main features are navigational menu links .Rss widget is ready.Main features are slider gallery for your posts.It also consists of three column footer.Search bar also ready with full blogger functionality.It can be said as both two column and three column template.I have provided you three versions of it.Use any you like. 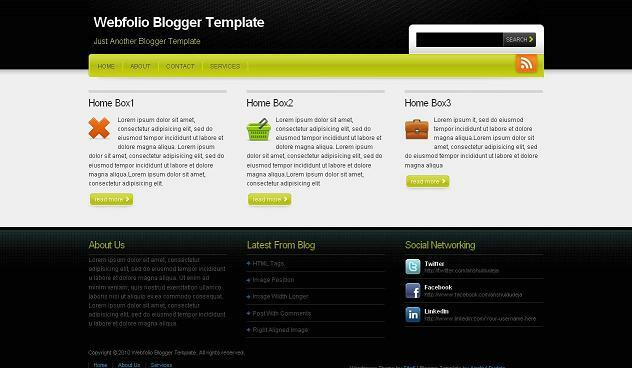 Other free premium blogger templates you would like for sure are Texture Art, Maimpok and Masugid. Just replace all red content above as written and also the image link.And keep editing all as below.You can add as many slider items also you want.Keep on adding them. If you like the social networking widget in footer of template demo then you can use below codes to use it else use any other widget you like. Im really like ur themes so much.. But anshul, this template is not displayed properly in internet explorer. its compatible with IE 7 and 8 not IE6. @faith just read installation of template as above and follow date format step man it will get removed. Nice work! 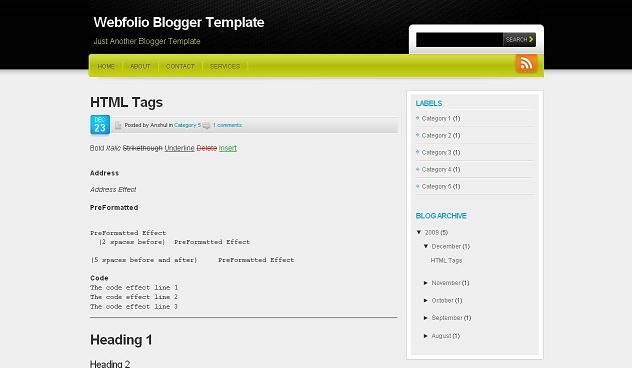 Got all the default functionality working so far and it looks great in IE7, Chrome and Firefox. I would like to use the 'Full Version' as a landingpage and a second page (from the menubar) for posts, like this: http://wordpress.site5.net/webfolio. Previous problem is solved using labels: works perfect! Another question: wich widget did you use for 'Recent posts'? I've tried a few but none of them seem to adopt the theme. @mein just use simple feed widget add a page element from layout and give your feed url will be good second option is take from http://feedburner.google.com/ you just need to first brn your blog feeds there. First AND second problem solved! Great advice. Here's a third: I just implemented a (standard blogger) poll. It doesn't seem to acquire the theme/skin. @mein when blogger give widgets they either automatic them to take syling from template or give options of colors to syyle.We cant do anything to it on our side. @husnul just try change position of script in template.Because when we use many scripts in template sometimes they clash each other and dont work.Either try placing the script before slider script or after.May be it can work but not sure. Hi Anshul, I am Ferdy from Indonesia. Thanks for this great theme. I've work hard here and there to set the theme..hahaha, because I'm just a newbie. I have a question. How can I put an icon or small picture together with the text on HOME PAGE WIDGETS below the slider? Just like what I see on the DEMO..
Hi Anshul, great theme, I love it, Thanks! But can you help me? I'd like to add on top menu two external links to the blog, I don't know where to add this URLs, please will you help me? Thanks in advance! Thanks for this great template. I have a few questions. -How can I change the "post title"s font and add hover effect? -What is the best way to add a logo for the header(maybe a letterhead)? -How can I change the language code for the sidebar titles? Some letters are not right when written in Turkish. @halil you have to chnage properties of tempate css to make these chnages.you should know abut it to make these many chnages in template. @wi its simple related post widget find for it in my blog u will get how to install. How can I integrate my "google custom search code" in the templates' search box? @halli chnage seach codes with google custom search. Congratulations its a Great work! I'm using IE8… I'am hosting my own js files. All codes works fine offline in my html editor…but not in my blog …..-.- any suggestion, please? @josh didnt got exactly what problem u saying.Show me demo.You saying about blogger post page or blogger pages. I managed to show my pictures in my recently post… I just upload once again the xml template and created a new post and viola!….but this time keeping the widgets that webfolio template doesn't need it….. it's ok to do that?? PS…if you need acess to my blog I will send you my info per your request. @kosh me using 2 bowsers mozilla and second IE7. SLider is showing images in both browsers of your blog.Chek your browser try updating it. Great template. Can you show me how to add the "Facebook Like" and how do I include the Page Post on the homepage? @bestpal find og google for like button u will get many tutorils as me not did this tutorial and page post on homepage didnt got what u want. Anshul, how can we remove the posts element from the home page? Thanks, its working now. Is it possible to use full version with posts element? I'm a big fan! Thanks for creating us great template! Keep the good work!